I was watching this documentary about Mark David Chapman and what possessed him to shoot John Lennon. It was pretty good. Chapman was obviously looney. Somehow he went through most of his life looking for his place. Always trying to figure out how and where he could fit in. Finally the book Catcher in the Rye took hold of him. His mission was to get rid of what he thought was the phoniness John Lennon supposedly represented. It didn’t make much sense to me either. The weirdest thing was how Chapman just hung outside Lennon’s apartment at the Dakota building in NYC until he would see him. It seems unthinkable that one of the most popular singers of the last century was so easily accessible. Nowadays anyone with just a smidge of popularity (even some who don’t have any) are surrounded by a squad of body guards. You can’t get within a block of them. Times sure have changed. 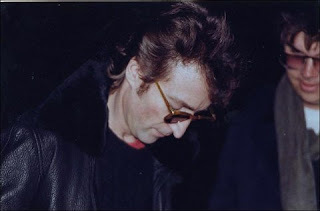 Chapman didn’t just see Lennon that one time when he shot him, but a day earlier. He actually approached Lennon and asked him to sign an album for him. Which Lennon did! 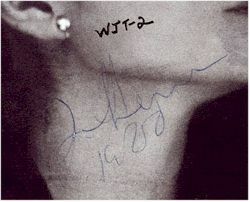 There was a photo that happened to be taken by someone at the moment John Lennon was autographing this album to Chapman. He wrote “John Lennon 1980”. The following night Chapman killed him. It’s a sad story and seeing all the footage of fans standing in Central Park singing his songs with lit candles is really touching. It’s probably a very petty thing to think about, but after watching this I started wondering where that autographed album went. They never addressed it again. I have a few autographs and enjoy looking at them occasionally. But that one in particular has to be considered a one of a kind piece. An autographed album by Lennon written to his future assassin. I’m guessing they wouldn’t let Chapman keep it in prison. And I’m sure Lennon’s family wouldn’t want it. Did the police keep it? Did it go to Chapman’s family? Was it destroyed? I realize it is a very petty thing to think about, but in my mind it’s somewhat a historical morbid piece and am curious to know what happened to it.